All roads may once have led to Rome, but all highways find their prototype in America; and Wenders, the maker of road movies par excellence, has always been the most “American” of the gifted directors in the New German Cinema. In Alice in the Cities, Kings of the Road, The American Friend, Wenders portrayed Western Europe as an Old World place decisively Americanized by the inescapable beat of rock’n’roll, the flicker of movie legend, the irresistible fluidity of streamlined transportation and streamlined criminality, and the beckoning hum—night and day, deep in the marrow—of highways waiting to be traveled. It seemed a foregone conclusion that one day Wenders should make a great American film. When he did come to the United States to shoot an entire feature (segments of Alice and American Friend had been shot here), it was, perversely, the wholly studiobound Hammett for executive producer Francis Coppola. As a lifelong Hollywood movie fan and a maker of European movies on the road and on a frayed shoestring, Wenders must have relished the opportunity to work in the most lavish of dream factories; but the fussy beauties of that environment finally proved as alien to him as Coppola’s Selznickean interference in the creative process, and neither the experience nor the results were happy. Paris, Texas is the great American film Wenders has been working toward throughout his career. 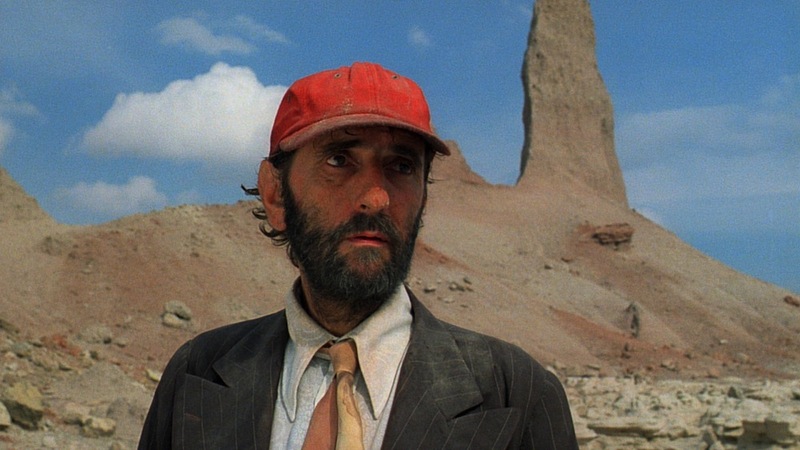 It’s as native as the terse cadences of Sam Shepard’s dialogue, the harsh/mellow Kentucky-bred tones of Harry Dean Stanton’s speech, and the austere grandeur of John Ford’s Monument Valley, where it begins (cinematically if not geographically). But the filmworld and its bleak, beautiful melancholy is all Wenders’s own. The story is easily synopsized (a Hollywood producer would appreciate that, even as he would be horrified, and mistaken, in how depressing it would sound to him): A middle-aged man named Travis (Stanton) has been wandering about the Southwest ever since the violent breakup of his family four years earlier. When he staggers, apparently mute and deranged, into an all-but-deserted tavern in south Texas, he is remanded to the custody of a local doctor, who places a phone call to a number found on the vagrant’s person. Travis’s brother Walt (Dean Stockwell) arrives from Los Angeles, retrieves him, finally succeeds in cajoling him into speech, and takes him back to L.A. Travis’s son Hunter (Hunter Carson), going on 7, has been living with Walt and his French-born wife (Aurore Clément) most of the time Travis has been away. They love him as their own, but place no obstacle in the way of Travis’s reestablishing an emotional bond with the boy. Once he has done so, the two of them set off for Texas in a car-truck to search for the wife and mother (Nastassja Kinski) whom neither has seen since the split. They find her. Terms are made. But the quest does not end: it only changes. Wenders tends to make long movies with the browsing feel of journeys. At 2 hours 20 minutes, Paris, Texas is no exception. That may sound like a lot of time to be taken up by a simple tale involving a very small number of characters, yet it’s the proper duration—I shouldn’t wish a moment omitted, a single development hastened more crisply along. The speed and pacing are faithful to the quality of life the director would have us not merely observe but experience. Besides, Wenders, reunited with his great cameraman Robbie Müller, is incapable of setting a shot before our eyes that is not heartbreakingly fine and plangent. He’s one of those rare film artists whose work is at all times immediately but unaffectedly about movies—how they feed our longing and answer our needs; how they may illuminate, may distort, the world around us; how they may illuminate by distorting into new perspectives. German cineastes have always been acutely frame-conscious, from the fatal nightmare constructs of Lang, Murnau, and Wiene in the Teens and Twenties, through the fiercely ironic and alienated compositions of the late R.W. Fassbinder in our own day. Wenders sees frames everywhere. More precisely, he sees screens: mirrors, windows, achingly empty doorframes, the sky; but most especially the windshields, side and back windows, and rear-view mirrors of cars. Enclosed within the screen we ourselves are watching, these pull at the eye and seem to pull at life itself, drawing the characters with a sweet and terrible urgency: Travel. Be in motion. Fill that space, drive or walk that road. Be a story. Find contentment. It scarcely seems as if anyone could write that kind of movie dynamism, yet one has only to reflect on the motel window of A Fool for Love, the L.A. vista become hallucinatory movie screen in Angel City, to realize that the playwright Sam Shepard makes an ideal collaborator for director Wenders. The very action of Shepard’s plays bears out that he writes in spaces, as surely as, say, Harold Pinter writes in pauses. Shepard and Wenders also complement each other in their reticence about their characters’ histories. Shepard’s judicious, tension-building use of lacunae in his characters’ pasts is mirrored in Wenders’ selective denial or delay of visual access—who’s facing which way in a conversation; whether we get to see a character the first time we hear him or her speak. The climactic scene in Paris, Texas, Travis’s extended dialogue with his estranged wife Jane, is readily imaginable as a stage scene in a Shepard play. If Shepard’s dialogue is allowed to come to the fore here as nowhere else in the film, still the scene conforms to the visual and conceptual logic of Wenders’s direction. Travis has followed Jane to the place where she works, a kind of brothel-by-phone parlor where the clients sit behind one-way mirrors talking with hostesses who inhabit mini-fantasy sets of choice—Hotel Room, Poolside, whatever. Although cut off from her view, Travis, who has come all this way and all this time to find Jane, elects to talk to her with his back to her and the mirror-window. Only gradually does she come to realize who her enigmatic patron is, and press forward to try to see through the glass. When Travis turns her way at the mention of his name, his own face is reflected on her dark silhouette, and a couple who cannot even share the same visual space anymore are reflected in one another’s forlorn hopes and dreams. I’d like to quote—but am heroically resisting the temptation—a dozen luminous, eloquent shots and scenes. Let’s grant Wenders his visual and emotional mastery for now and simply take note of another dimension of this flawless film, the slide-guitar accompaniment by Ry Cooder. Splendidly appropriate, of course, to Wenders’s scenes of desertscapes, off-the-main-drag small towns, and freeways arcing into infinity, Cooder’s music achieves its finest effect in a scene wherein it is difficult to be sure music is even present. On their last night before the reunion with wife and mother, Travis and Hunter sit in a deserted waiting room (hotel lobby? bus station? ), the drunken Travis talking about his father’s failure in marriage. As is the way of it in Shepard country, the story becomes Travis’s own (though it continues to be his father’s, too). While Travis tells his story, a verbal dying fall, Cooder’s music vibrates tentatively on the soundtrack, less like music than the sound of road traffic in the great distances inside one’s mind, overheard sporadically but never quite located in space-time reality. I can’t let Paris, Texas go without paying one more specific tribute. It took a foreign filmmaker, with his heightened awareness of what is at once exotic and peculiarly valid in the textures of American cinema and the American experience, to realize that the unheralded character actor Harry Dean Stanton not only could, but deserved to, carry a major feature film. If (unimaginably now) Stanton is allowed to recede into the obscurity of who-was-that-guy-in-the-corner-of-that-scene?, he will still be assured a place of honor in the gallery of great screen acting. He enters the movie walking across a trackless land (“a deep, vast country where nobody knew him, without languages or streets”), moving fast, relentlessly, never looking sideways and heading he has absolutely no idea where. When Dean Stockwell drives across his path and coaxes him into the car, Stanton hesitates, jerking glances at the distance, as if unable to get used to the idea he isn’t still walking that straight line into oblivion. It’s only one among many piercingly true moments in the performance of, and for, a lifetime.